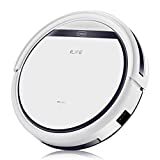 If you want a great little robot vacuum cleaner that forgoes the bells and whistles to keep the price down, the upgraded version of the ILIFE V3s Pro Robotic Vacuum is just about as good as it gets. This great self-navigating vacuum has about 1,000 5-star reviews on Amazon because it offers great suction and decent battery life for under $200. That price drops even lower than normal today, however, because Amazon is running a big one-day sale that slashes this great model to just $111.99!